The release of AS/NZS 5532:2013 Manufacturing requirements for single-point anchor device used for harness-based work at height has introduced a number of new requirements and set a uniform national benchmark for testing and certification. Traditionally manufacturers applied a static load to the anchor, which placed the least amount of stress on the product. A dynamic test replicates a person suddenly falling and being jerked to a halt. – for 15kN, or single-person fall arrest use, drop a 100kg load through 2 metres. The dynamic test demands anchors hold the load for three minutes after the sudden drop, without showing any sign of breaking or cracking. The anchors may of course deform, provided there is no sign of permanent damage. 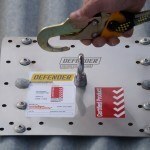 Defender anchors have been scrutinised and independently certified by SAI Global™ experts to comply with AS/NZS 1981 and AS/NZS 5532. This means each and every batch is proven to meet AS/NZS 5532 in a NATA™-accredited facility. You’re welcome to see the drop test for yourself.